The Glacier Wax Clearomizer from Vhit is the latest in the Vhit line and has by far surpassed other wax burners in this category of clearomizers. The Glacier produces copious clouds of vapor and the flavor is fantastic. Because of the design, it eliminates clogging and misfires. Its tank is made of Pyrex glass and has a stainless steel body. 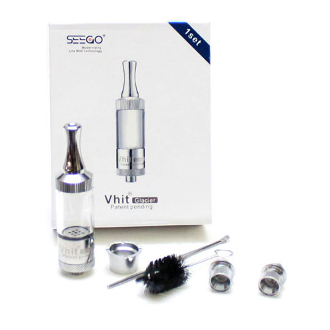 Also, not only does this clearomizer give you the capability to replace the coil heads, it can be fully disassembled. This allows for thorough cleaning and maintenance. It is 510 threaded and will fit on any eGo battery.